Papaya Playa Project in Tulum. All photos by Victoria Lewis. The Yucatan Peninsula is on everybody's travel list. And for good reason. The region takes beach vacations in Mexico to the next level. 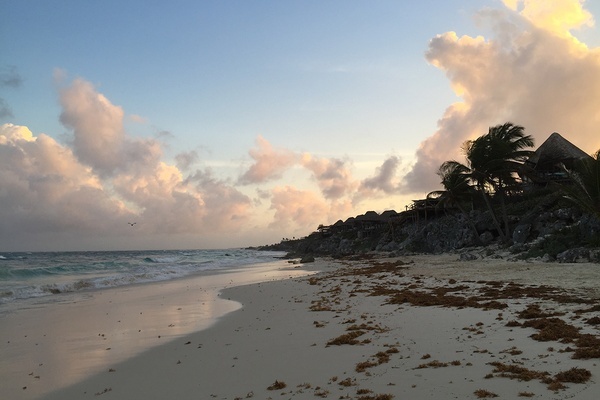 Here's what you need to know about Tulum, Merida, and Valladolid. MEXICO – As the fair-skinned daughter of a very red-headed father, beach vacations usually entail lots of SPF 50+ and hours spent hiding under umbrellas. I love the sun, but my skin not so much, which is why I have made a habit of choosing beaches that also offer a serious dose of culture on the side. The Yucatan Peninsula is exactly that kind of place. The Yucatan Peninsula separates the Caribbean Sea from the Gulf of Mexico. It is best known for the white sand beaches of the Riviera Maya — Cancun, Playa del Carmen, and Tulum. While those destinations alone merit a trip, the peninsula also includes the vibrant, colonial cities of Merida and Valladolid, as well as miles of ancient Mayan ruins like Chichen Itza. It's a magical place where you can spend a night at a rustic hacienda-turned-boutique hotel, dive into hidden underground cenotes, and wander the colorful street fairs of an historic town — and still find plenty of time to lounge under a palapa on the beach. It also happens to be one of the safest areas to travel in Mexico. The Yucatan Peninsula is deceptively large. The drive from Cancun to Merida takes a little over three hours and the drive from Merida to Tulum is about the same. That said, the area is best explored by car. The roads are well maintained, and my boyfriend and I felt remarkably safe, minus a few slightly intimidating police checkpoints. A car allows you to scope out the lesser-known parts of the region that wouldn't necessarily be seen on day excursions from Tulum or Cancun. 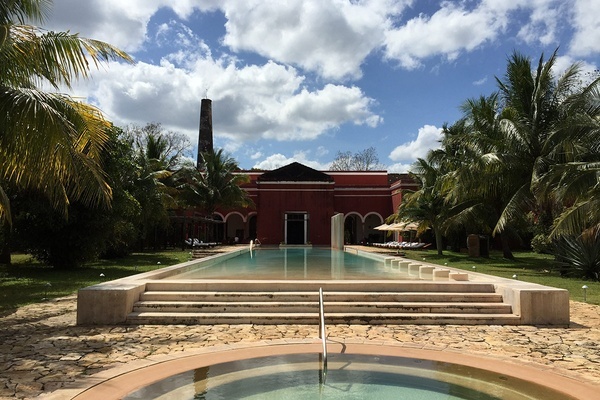 A collection of working haciendas have been converted into boutique hotels owned by Starwood. They came highly recommended from both travel sites and fellow travelers. I can't speak for all of them, but the one where we spent a night, , was a bit past its prime. The grounds were run-down and the restaurant was disappointing. We checked out after one night even though we had booked two. I would recommend sticking to the more lively towns or spending extra days at the beach (as we did) instead. 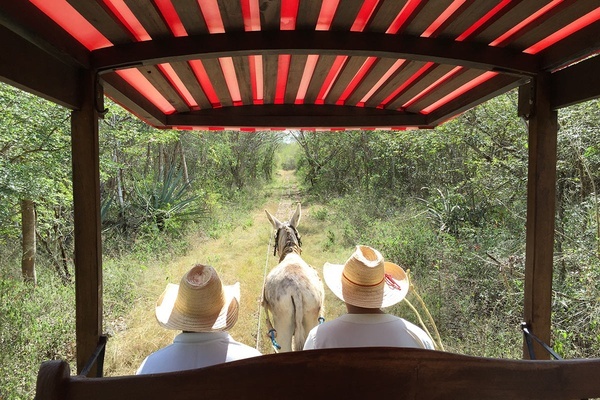 A donkey ride from Hacienda Temozon to a cenote nearby. Merida is best explored on foot. Stroll to the main square for a view of the historic cathedral and walk down some of the smaller side streets to see the colorful houses dotting the residential area. While wandering, pop into the local markets and boutiques for hand-embroidered textiles and intricately painted pottery. The local crafts markets (there are multiple, all located a few blocks away from Plaza Grande) like Bazar Garcia Rejon (517 Calle 65; no phone) are usually teeming with people. If treasure hunting is your thing, you'll love the bustling markets. If you prefer a slightly less crazed retail experience, there are plenty of cool, curated boutiques. We picked up colorful pillowcases and gorgeous ceramic serving bowls at the boutique in and hand-blown glasses at down the road. On the way back to our hotel, we stopped by a shop called and picked up bars of Mexican chocolate in flavors like pink peppercorn and baked corn chips for our friends (and a few for ourselves, too). Merida has become a gourmand's paradise. There are plenty of classic establishments like , where you can eat traditional local dishes (grilled meats and delicious spicy sauces) while watching a woman in the corner make piles of steaming tortillas. When we stopped for lunch on a Sunday, we were the only English-speakers in the restaurant. Order the signature chaya drink, a bright green juice made from the leaves of the Mayan chaya plant, which is said to have a whole host of health benefits. Of the many newer restaurants serving contemporary takes on Mexican classics, we loved in charming Plaza Santa Lucia. Ask for a table outside, because on most nights local bands and traditional dancers put on performances on the plaza's outdoor stage. Order the signature mayahuel cocktail or any of the margaritas, and ask the waiter for recommendations from the menu — every dish we ate was delicious. If you have room after dinner (or are in need of a refreshing afternoon treat), the new-ish ice cream shop , across from hotel is adorable and offers a rotating list of unique flavors. We loved mango with chile and pumpkin spice. While in Merida, a good friend recommended taking our relationship with Mexican cuisine to the next level with a cooking class at chef David Sterling's . 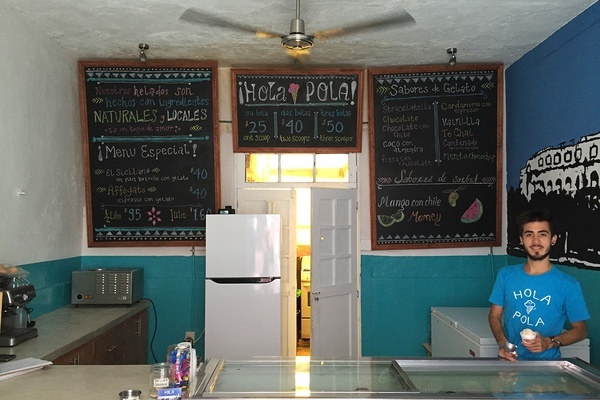 Pola ice cream shop in Merida. 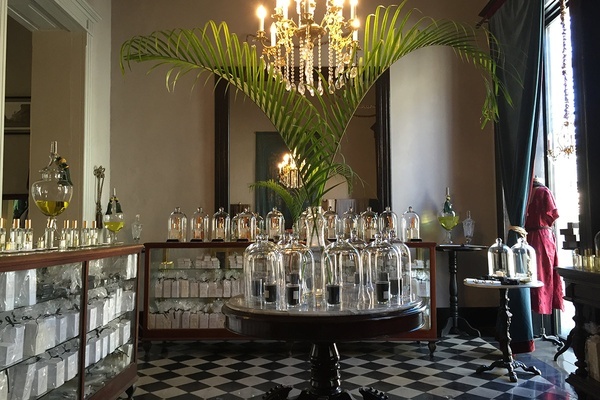 The perfumery at Coqui Coqui in Merida. While Valladolid is significantly smaller that Merida, it has a number of excellent restaurants. We had a decadent late lunch on the back patio of . Margaritas as big as my head and heaping plates of the local specialty cochinita pibil (a slow roasted pork dish that is life-alteringly good) put us in a total and heavenly food coma. For something lighter, offers a pretty outdoor seating area and a menu of juices, smoothies, and salads. I ordered a salad that was one part lettuce and three parts guacamole and felt very happy with my virtuous, health-conscious decision. Valladolid has a significantly more manageable crafts market in its central square filled with locally made artisan souvenirs. If you're looking for upscale, gorgeous is a boutique owned by two Italians who relocated to the Yucatan in 2007 and stocked with chic clothing, accessories, and leather goods inspired by traditional Mexican designs with a slightly more urban, refined look. You need to drive a few miles out of town for a culture fix. Go west to or north to its smaller but no less impressive counterpart, Ek Balam. The capital of the Mayan empire for centuries, Ek Balam is one of the area's best-preserved archaeological sites and is usually significantly less crowded than the more famous Chichen Itza. On your way to and from the sites, you'll drive past street vendors selling souvenirs, including colorful hammocks which are very cool if you have a place to hang one at home. As seen from a bike ride in Tulum. The beach at Be Tulum. 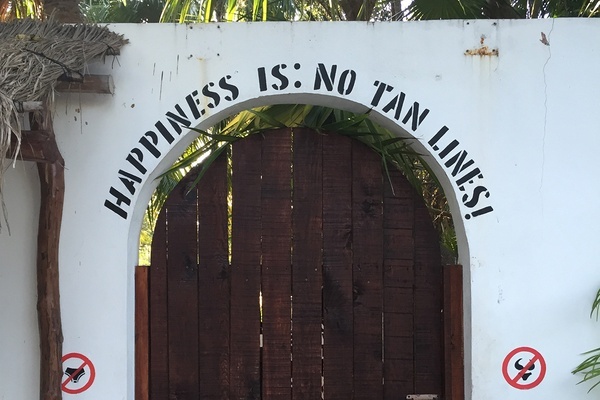 At this point, pretty much every hotel in Tulum has embraced the whole health and wellness thing. Most offer complimentary morning yoga classes as well as beauty and health treatments. This makes it easy to start the day with sun salutations, even if the rest of it is spent sipping margaritas by the beach. If you want to get a little deeper into healthy living, check out at . In addition to typical spa treatments, they offer unique experiences like Aztec Chakra Balancing Massage and Ceremonial Temazcal, a traditional ceremony of Mayan origin that purports to detox both mind and body. A perk to all the expats flooding Tulum is the food. There are seriously delicious restaurants in the area. Just be sure to make reservations or go early, as they all tend to fill up pretty fast. 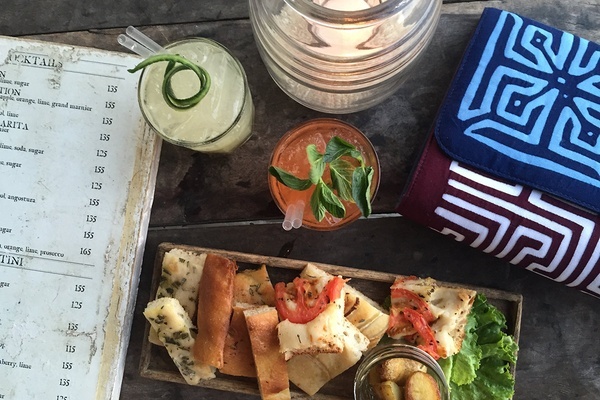 For great Italian food, killer cocktails, and an unobstructed ocean view, is perfect. has a lively atmosphere, small plates, and fun people watching. is the go-to for lunch or dinner if you want the best tacos in Tulum. More traditional Mexican food, live music, and even flamenco shows are found at , morning or night. And for ridiculously fresh food from a wood-fired oven, the now famous is a must. Just line up before 2 p.m. to get your name on the list. Otherwise, you're likely out of luck. Side note: In Merida and Valladolid, we were amazed by how inexpensive our fit-for-a-king feasts were. 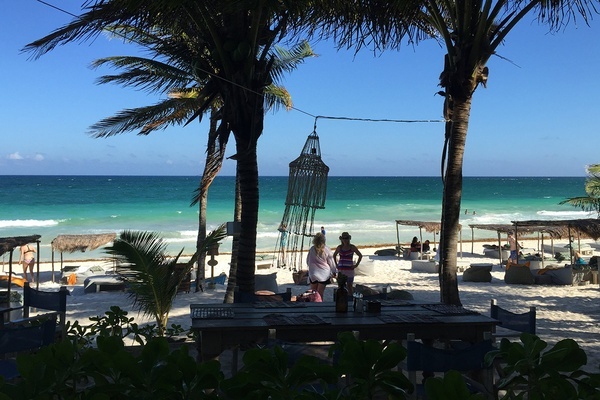 Tulum, however, is a barefoot beach town with New York City prices. Be advised that many places only take cash and that the ATMs in town break down regularly. 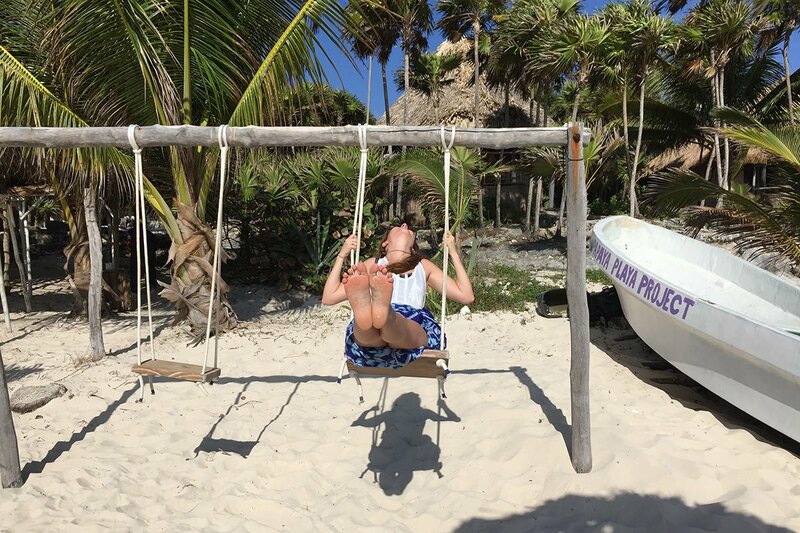 Part of the appeal of Tulum is the chance to slow down, lounge on the beach, and do absolutely nothing. But when you need a change of pace, there are plenty of activities to entertain. My boyfriend took kite surfing lessons at . Another day, we drove 40 minutes inland to the Mayan ruins of Coba. When we were finished, a local guide directed us to the nearby cenotes, where we took an afternoon swim in super clear, cool water. The restaraunt at Las Ranitas hotel. Interiors at Coqui Coqui hotel. On my list of favorite hotels in the world, in Merida ranks high. The single-room hotel feels more like a cool friend's home than anything else. 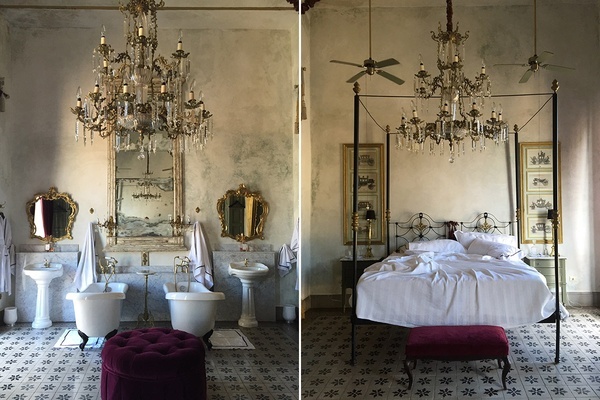 You enter through the beautiful ground-floor boutique (Coqui Coqui is a luxury fragrance brand) and are led to your room on the second floor, a room that is nothing short of spectacular. A wrought-iron canopied bed sits opposite a massive gilded mirror and two ornate bathtubs. Every detail of the restored belle époque mansion is exquisite, including the terrace and private pool. At night, the proprietor hands you the keys and you are left to come and go as you please (the hotel is also perfectly located in the center of Merida). Coqui Coqui also runs small hotels in Valladolid, Coba, and Tulum. In Tulum, the accommodations are simple, thatch-roof palapas. Most hotels are small and are booked early. We spent two nights at , a Design Hotel with a young vibe and an excellent stretch of white sand beach. The rooms range from shared-bathroom backpacker huts to luxe air-conditioned suites. We chose a mid-level room, and it was outstanding. For the last two nights, we moved to , which was smaller and more elegantly appointed. The hotel is closed for renovations and will re-open in 2016. Another favorite along the beach is . The only hotel with air conditioned rooms, it's a gorgeous property with all the amenities of a luxury resort, but the same laid-back vibe as the rest of Tulum. Sunset at Papaya Playa Project. Major airlines offer daily flights to Cancun International Airport (CUN). From there, it is possible to take a quick 45-minute flight to Merida, though we preferred the drive, as it allowed us to make stops along the way. Renting a car is a must. I recommend choosing a more reputable rental company like Hertz or Avis, even if they're more expensive. It's worth having a slightly more reliable car to know that the car you requested will be there in the first place. GPS is also necessary. Cell service can be spotty and many of the roads are unmarked. In Tulum, many people get around on bikes. Most hotels offer free or inexpensive bike rentals. I recommend biking during the day but taking taxis at night as the main road between the hotels and restaurants gets dark and highly trafficked. Day 1: Fly from NYC to Cancun. Pick up rental car and drive to Merida. Stop for lunch and shopping in Valladolid on the way. Quick stop to see Chichen Itza in the afternoon. Stay at Coqui Coqui Merida. Day 2: Explore Merida in the morning. Drive to Hacienda Temozon in the late afternoon. Day 3: Drive to Tulum. Stop back in Valladolid for lunch en route. Stay at Papaya Playa Project. Day 4: Beach day in Tulum. Sleep at Papaya Playa Project. 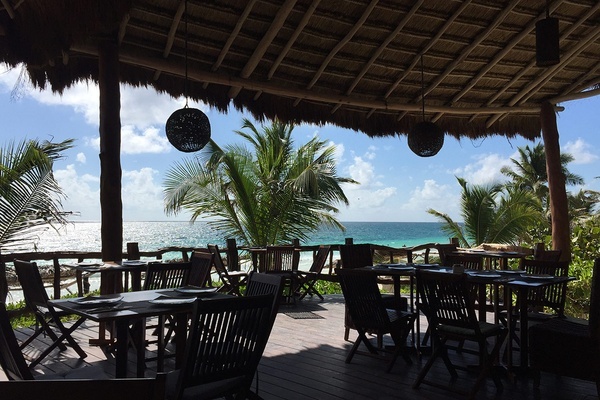 Day 5: Move down the beach in Tulum to stay at Las Ranitas. Day 6: Another beach day. Sleep at Las Ranitas. The winter holidays between October and January are peak season in this part of Mexico and hotels book up quickly. We went in late February and found things a little quieter, though by no means empty. You can visit any time of year, but it's best to avoid May-August as it can get extremely hot and many hotels don't have air conditioning. У нашей организации важный web-сайт на тематику www.progressive.ua.